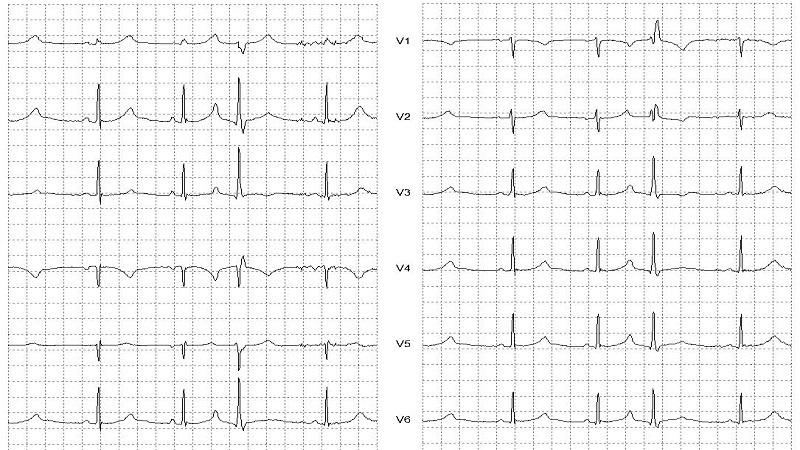 An SVEB with a QRS configuration different or altered from the Normal Sinus QRS, usually seen with a widened or bizarre QRS configuration due to the SVEB impulse propagation through the ventricles during the partial refractory phase. Hence, a QRS configuration similar to that of a VEB. SVEB's with aberrant ventricular conduction are generally recognizable when the ectopic P-wave precedes the QRS complex. In all other cases, the presence of Ashman's phenomenon or the concurrent display of a Normal QRS configuration on another recorded channel will be utilized in determining this classification.